Fennel is a lacy leafed back of the garden herb with an anise smell and taste. Fennel attracts beneficial insects to your garden. umbels makes a good back-of-the-border plant or adds architectural interest when planted among shorter specimens. The cultivar ‘Rubrum’ has a bronzy colored leaf. 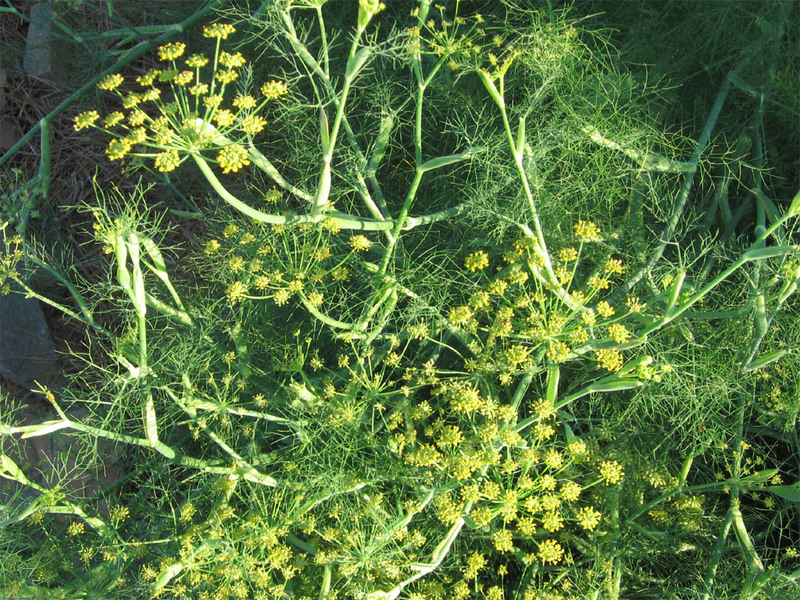 Fennel flowers will attract beneficial insects like bees and parasitic wasps to your garden. Don’t panic if you see a green caterpillar with black and yellow markings munching on fennel leaves. It is the larvae of the black swallowtail butterfly. Fennel plants are large so there will be plenty for the caterpillar and you! Fennel is a semihardy perennial, often reseeding, grown for its leaves, seeds, and stems. It can handle the winter temperatures here in Southside. The branching erect stems are round, smooth, striated, and a glaucous blue-green in color. The taproot resembles a carrot. The leaves are fine and feathery, alternately branching from the stalk. The small yellow flowers are in a compound umbel. Height can easily reach 4 or 5 feet. Heavy clay soils will hinder the seed growth, so we in Southside Virginia must amend our soils with organic matter to ensure a well-drained bed. Direct-sow seeds in full sun and keep beds moist, but do not overwater, for two weeks until first leaves appear. For continuous crop, make succession plantings through mid-August, which will yield a fall harvest. Do not plant near bush beans, caraway, tomatoes, or kohlrabi as it can have damaging effect on these plants. Conversely, fennel can be harmed if planted to close to certain herbs; coriander will prevent seeds from forming and wormwood can reduce seed germination and stunt the plants’ growth. All parts are edible. When the plant is established, leaves can be snipped and stored loosely in containers or frozen for later use. Stems are ready for harvest when they begin to fatten (about 80 days to maturity). Harvesting seeds requires precise timing. Watch closely for seeds to turn from yellowish green to brown. Cut entire head; let it drop into a brown paper bag and store in a warm dark place for further drying. Once dry, store in jars for year-round keeping. Fennel tastes like a softer and nuttier version of anise. Use fresh leaves in salads and as lacy garnishes; the tender stems can be eaten like celery. Fennel fares well with fish, sausages, duck, barley, rice, cabbage, sauerkraut, beets, pickles, potatoes, lentils, breads, eggs, and cheese. The leaves and stems add aroma and flavor to herb butters, salad dressings, and Chinese marinades. Mix well. Use for marinade for pork, shrimp or chicken. Marinate for several hours or overnight. Grill or broil meats. When we think of July in the garden, we think hot and humid and no rain. Not to worry, most herbs love these conditions. 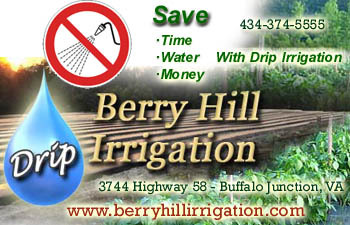 No need to water unless your herbs are in pots and then a weekly drink is appreciated if there has been no rain. Now is a great time to take cuttings from your favorite herbs such as rosemary, sage, mint and lavender. Deadhead flowers from herbs to allow the plant to grow more lush. However, bees love herb flowers so leave some for them. Don’t let weeds take over and rob your herbs of nutrition and water. Make sure that weeds do not have an opportunity to go to seed. Harvest herbs as needed. If using fresh, harvest at any time. If you plan to dry the herb, harvest early in the morning or late in the afternoon to preserve peak flavor. The Southside Virginia Herb Society is a group of local enthusiasts interested in learning and sharing knowledge of gardening, crafting and cooking with herbs. Members come from Halifax, Mecklenburg, Lunenburg and Charlotte Counties. For more information contact Kathy at 434-454-4208 or e-mail kathymmmg@hotmail.com.